Playground of the Riviera, elegant little Monaco measures only one square mile in size. Yet the outsize appeal of this jewel-like principality lures everyone from carefree couples to crowned heads. Monte Carlo is one of Monaco's four sections, and the most interesting one to visitors as most of the hotels, restaurants, and attractions are located within it. It should come as no surprise that everything from meals to accommodations are expensive here in Europe's yacht-and-Rolls-Royce capital. Even if you can only visit for a day or stay for one night, it's worth experiencing this unique city, which boasts an average of 300 days of sunshine per year—and there's no charge for that. Enter a world of rococo opulence at the Hotel de Paris in Monte Carlo. 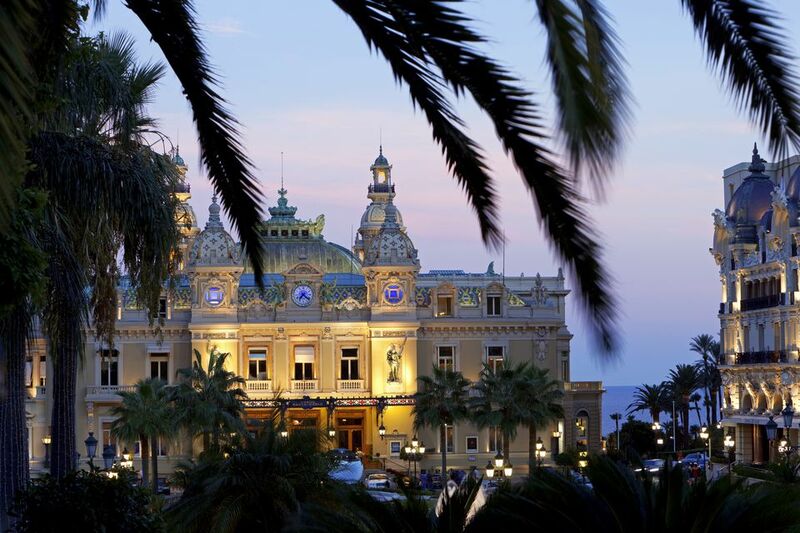 Like the Casino de Monte Carlo, the Opera de Monte Carlo, and a number of other premier hotels, restaurants and night clubs, it is part of the Société des Bains de Mer, which is primarily owned by the ruling Grimaldi family. Originally built to house wealthy gamblers drawn to the Casino de Monte Carlo, the Hotel de Paris, which opened in 1864, was the city's first accommodation. Since then the monied, the monarchs, and even the newly married have been drawn to this exquisite five-star hotel. You'll want a room (or, even better, a suite) on the fourth (top) floor overlooking the Casino de Monte Carlo. The view from the French balcony encompasses the casino, the Rolls-Royces and other shiny marques parked below, and the blue Mediterranean studded with magnificent yachts. At Le Grill atop the hotel, which overlooks the harbor, waiters serve in formal tails. Each table's crystal, silverware, and china is polished to a high shine and properly set. The romance of this room intensifies after dark, when the ceiling retracts and the stars twinkle upon this privileged aerie. Also owned by SBM, the Monte Carlo Beach Hotel is set on a cove overlooking the principality's shoreline. This sleek, modern hotel first opened in 1929. Recently restored, it evokes the French Riviera of yesteryear, yet is as stylish as tomorrow. Oriented to the Riviera, the hotel offers a safe, gentle place to swim in the sea. Fans of watersports can jetski, waterski, and parasail here. Tents, cabins, and sun lounges are available for rent on the private beach. There's also an Olympic-size seawater swimming pool heated to 75 degrees. The hotel holds only 40 rooms and suites. More than a satellite of its posh sibling the Hotel de Paris, it is a destination in itself and a member in the Relais & Chateaux group of extraordinary properties. Tidy and nautical, standard guest rooms mimic the feel of being on one of the smaller yachts in Monte Carlo harbor. The shower, which is big enough for two, features a large round window that works like a porthole to the view. Your room key card entitles you to free entrance to the Monte Carlo Casino and the free shuttle that travels between the various Société des Bains de Mer properties. Treat yourselves to dinner at Michelin-starred Elsa's restaurant, named after the legendary hostess and yenta extraordinaire Elsa Maxwell, She was the first public relations representative of the Society des Bains de Mer. High atop a rocky hill overlooking Mediterranean Sea, the Prince’s Palace of Monaco was originally built as a German fortress in 1191. At the end of the 13th century, Francois Grimaldi, a member of an aristocratic family, disguised himself as a monk and requested shelter there. Once admitted, he and his men killed the guard and captured the fortress. Despite incursions and attacks from the French, Italians, Germans, and English, the Grimaldis stood their ground. Over the centuries the palace has been extended and restored. Today it is open to visitors from June to October. Some areas are open to the public, revealing spots where his Serene Highness Prince Rainier III and Grace Kelly lived. Rooms are inlaid in marble with mosaic designs including the prince's double R monogram, the furniture is Florentine and Boulle from the reign of Francois I, and walls are draped in silk brocade and damask and decorated with royal portraits. Arrive in time to see the Changing of the Guards at 11:55 am daily. The best view is outside the royal entrance on the Palace Square. An American actress known for her classic beauty, Grace Kelly was swept off her feet by a genuine prince in one of the greatest love stories of the 20th century. She married Prince Rainier in 1956 and they had three children: Caroline, Princess of Hanover; Stephanie; and Albert II, Prince of Monaco. Tragically, Princess Grace died in 1982. While at the wheel, she suffered a stroke and lost control of the car that she was driving. To honor her memory, the broken-hearted Prince Rainier III had The Princess Grace Rose Garden created. The beautiful and fragrant Rose Garden is perhaps the most romantic spot in all of Monte Carlo. Take your time strolling through it together and see how many of the 300 different varieties of roses you can identify, including the lovely Princess Grace de Monaco Rose. For more than 40 years, the world's largest and most prestigious circus event has come to town in Monte Carlo. It's held under the big top at Chapiteau de l'Espace Fontvieille. The 2018 dates are January 18-28. The circus is followed by a competition of young artists from around the world that is presided by HSH Princess Stephanie of Monaco and her eldest daughter Pauline Ducruet. Here fans will can a first and up-close look at the future talents. The annual Monte Carlo Gastronomie is a gathering of more than 100 French, Italian, and other European chefs, vintners, and food producers. It provides foodies with an opportunity to taste and purchase wines, Champagne, cognac, armagnac, and liqueurs as well as chocolates, candy, cheese, meats, jam, and more culinary specialties. Once you've had your fill of gourmet fare, browse for enduring souvenirs. Tableware, kitchenware, and other items for the home that are sold here can become lifelong reminders of your visit to Monte Carlo. Whether you're in the market for a 305-foot-long yacht like the shiny new Aquarius or just like to dream, the annual Monaco Yacht Show in Monte Carlo harbor displays 125 one-of-a-kind superyachts built by the world’s top shipyards. You'll need to buy a ticket to attend the show, but there's no fee to walk beside the waterfront and see other incredible vessels that dock here. Admire the yachts up close; if you're lucky, you just might be invited aboard. Try your luck or simply gander at the grandeur of the circa-1863 Casino de Monte Carlo, the world's most beautiful and famous place to lose or win money playing baccarat, blackjack, punto banco, and other games of chance. The Belle Epoque Grand Casino is graced with rococo turrets and verdigris cupolas. Inside, golden chandeliers illuminate play. If the Casino de Monte Carlo looks familiar, it's where scenes from the 1995 James Bond movie GoldenEye were filmed, and it retains that aura of sophistication. Plan to dress your best before entering. Donning a long gown or tuxedo isn't required, but you may see fellow players garbed in that fashion. The intimate, light-filled spa inside the Fairmont Monte Carlo, which is one of the largest hotels in Europe, seems designed for lovers. Two "couples experience" suites feature double jetted tubs, steam showers and overhead rain showers sized for two. The 90-minute Couple’s Bliss treatment includes 60-minute side-by-side massages followed by 30-minute facials. Dine at NOBU for an extraordinary sushi dinner at the hotel, and enjoy the breathtaking views from the terrace where your meal can be served. Practically the entire city shuts down for the annual Formula 1 race held every May. Expert drivers circle the 2-mile-long Monaco Grand Prix circuit 78 times, precisely navigating hairpin turns on narrow city streets that leave no margin for error. The course parallels the yacht harbor in many places. Find spots on the grandstand to cheer for your favorite drivers and teams in this glamorous race. The Grand Prix attracts passionate fans and international celebrities who follow this thrilling sport that makes hearts, as well as vehicles, race.